Earlier this month, I shared a free hand embroidery pattern for stylized grapes with you. Well, here’s a similar design, only this is for wheat. Both designs are the same size, and they’d make nice matching “tiles” for embroidery. 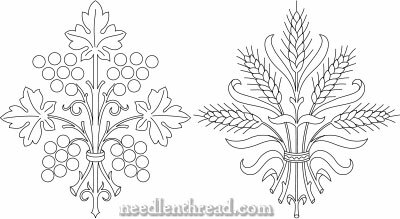 Just like the grapes embroidery pattern, this wheat design has lots of possibilities – from whitework, to goldwork, to silk shading, or just simple surface embroidery on a kitchen towel. They can both be adapted to church embroidery projects as well. An alternating series of them could be spaced along the front of an altar frontal, for example. The design prints at about 5″ tall, but you can enlarge or reduce it to suite your needs. You can find a huge variety of free hand embroidery designs here on Needle ‘n Thread, for your stitching pleasure. Just click on the “Patterns” link in the top menu here on the website, and browse to your heart’s content! 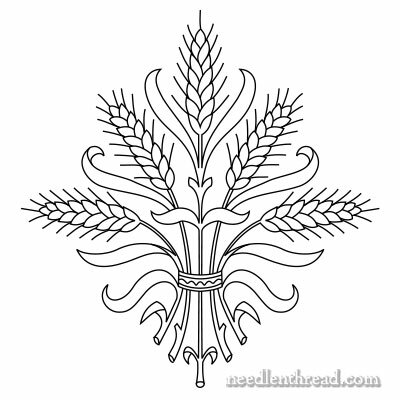 Wheat motifs are among my favorites – this is lovely! Thank you Mary for sharing. A lovely wheat pattern and as you say lots of possibilities there, thanks for sharing this with us. I will be working on the wheat one next. Thank you so much for your site, for your lessons, for all of the free patterns 🙂 It really means a lot to me especially since I am unemployed. Previous Previous post: Monograms: The Art of Embroidered Letters – Winner!